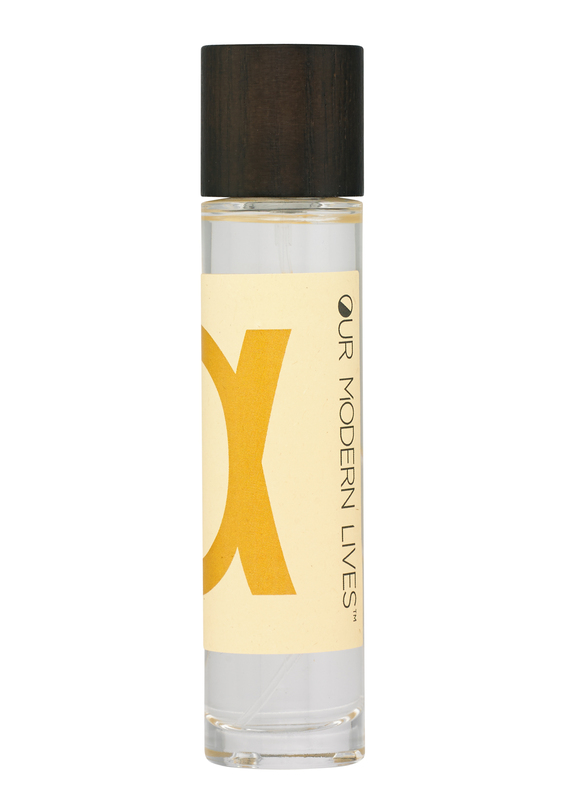 Our Modern Lives is a fragrance project by Sarah McCartney of 4160 Tuesdays. So what it is? Well, it’s a line of 7 natural botanical-based fragrances and 2 “gentle” synthetics. What I like about it, is that it’s not born out of some marketing scheme disguised as some moralistic “chemicals are bad” propaganda. It’s from demand. Customers wanted naturals and “hypo-allergenic” fragrances so she created a line for them without confusing it with her established, mixed medium 4160 Tuesdays brand. The synthetics are there to be layered with the naturals to increase longevity or to be worn alone. But, what I like is that it is up to the consumer to decide if they would like that or if they’d rather stick to the naturals. Anyway, this line is an extension of a project that Sarah did years ago where she merged her background as a yoga instructor with that of being a perfumer. She created “yoga room sprays”. That’s why you’ll see these perfumes available as personal fragrance and/or environmental scents. These are the all-natural botanicals that customers were asking for. I’m going to let you know that like so many naturals that I have tried over the years, that projection and longevity are below average in comparison to synthetic and mixed-media perfumes. There’s seven of these and they cover a rainbow of shades. Notes of pink peppercorn, pink grapefruit, hazelnut, hay, Turkish rose, raspberry leaf, oakwood, labdanum, wine and davana. I tested all of these before reading the note lists. My notes were just “fruity wine”. And that’s what it is supposed to be! It’s like a sangria. It has berries, citrus and red wine. It smells like sunny summer days. It’s one of my favorites from this collection. Notes of neroli, rose geranium, Virginian cedar, honeybush, vanilla, peach, blood orange, bergamot, carrot seed, cocoa and bran. With the orange packaging and name, I expect for this to smell like oranges. It does! It smells like those orange gummy candies that look like orange slices covered in sugar. it eventually becomes a tangy neroli with a hay-like base. Like many people, I expect for a yellow perfume to smell like citrus. This one does. It’s a really bright citrus with lemon and oranges. But, this doesn’t smell like the typical “eau de cologne”. It has an expected sweet, earthiness from coffee and fennel in dry-down. It’s a fresh, happy fragrance and it’s super creative. It’s all these usual “fresh, happy” notes but paired with stuff they’re rarely paired with (like coffee and fennel). Notes of bergamot mint, jasmine tea, green mandarin, Calbrian bergamot, cucumber and spinach. Green, as expected, is verdant. It’s like a perfume equivalent of “green juice”. It’s minty cucumbers, lemon and dark, leafy greens. That may sound weird for a perfume, but I’m actually really drawn to this one because it smells like gardens and green juice. It’s my favorite out of the collection. Notes of English lavender, white grapefruit, rosemary, olive fruit, jasmine sambac, blue hemlock, jasmine tea and seaweed. In my opinion, this is the weirdest one. It smells like seaweed and vinaigrette (olive oil, salt and rosemary). It eventually smells like a heady jasmine. I’m still trying to wrap my head/nose around this one. It’s weird but that’s good! This is why I love indie perfume so much. I mostly get lavender and vetiver from this one. My notes also said “green peanuts”. And once I picked up on green peanuts (for those of you that are Southern like myself, think boiled peanuts), I couldn’t “unsniff” this aspect of the perfume. But, then I started to love it for this. Out of all of these, Indigo is the “darkest”. It reminds me of coconut water and fancy, fruity liqueurs. The jasmine sort of comes across like a plum syrup. Anyway, if this was interpreted as a rum-based cocktail, I’d happily drink it. Out of all seven of these, Indigo has the most swagger. Overall, these smell “natural” (duh), but are different than a lot of natural brands I’ve tried. It seems that the palette expands past “aromantherapy” and there are some interesting interpretations of the rainbow hues here. My favorites as a personal fragrance are Green and Red. My personal favorites for a room spray include Aquamarine and Indigo. These are the hypo-allergenic layering bases. Basically, these are described as “gentle” and even though it’s completely possible to be allergic to these, there’s less of a risk in comparison to naturals. That’s one thing that doesn’t get talked about that much in perfumery. Most of the times if you are allergic to something in a fragrance (develop a rash, etc. ), that something was most likely a natural. Nature has to always “one up” us humans! Anyway, Sarah made these in response to those asking for a “gentle” fragrance. So, here they are: stripped down synthetics with a positive track record. This is a woodsy amber that smells like the base of a lot of perfumes. It’s that sharp woods that I smell in a lot of mainstream masculines. It’s not my thing but I can see it working for people that like Escentric Molecules. I can barely smell this one at all. I can tell it’s musk but that’s about it. It’s like the epitome of “skin scent” in that you can’t really smell much of it. If anything, it reminds me of iced vodka and some airy musk. I think it’s a good idea and I like how the brand responded to customers wanting naturals. There’s a lot of transparency with these. I like seeing them presented as not something like good/bad (like a lot of “clean beauty” marketing). Like you have to comply to IFRA’s standards in Europe. Aromachemicals have already been evaluated for safety, etc. But, that doesn’t mean that a person may not be allergic. There’s a misconception that “natural” equates to safe. This brand helps to address those misconceptions but also gives customers botanical perfumes. It’s not that one is better than the other, it’s just sometimes you do want something that seems different. And I think in this case, these seem less “corporate” and more creative…and seven of them just happen to be natural too. Currently the brand is available at 4160 Tuesdays. Full-sizes and discovery sets are available for purchase. There’s also an environment/room spray that can also double as a light personal fragrance. *Disclaimer – Samples provided by the brand. I am not financially compensated for my reviews. My opinions are my own. Product pics from Fragrantica. Pattie Boyd, Kellie Wilson and ? by The Fool Design Collective pic for Vogue UK 1968 from pleasurephoto.wordpress.com. This is really interesting. And I agree, it’s great that they didn’t position it with the usual “fear chemicals, embrace nature!” stance, which makes me both angry and sad at the state of our society’s scientific literacy, or lack of it. I’d be much more inclined to just skip the synth layer and reapply more of the natural base as it wore off, unless I could really control the amount of synth. I really dislike the sharp woody musk stuff like both Escentric Molecules scents. They pierce me in the eyes, nose and throat. Gah. I just like things that smell good. But, I hate fear-based marketing so much. Your eyes would roll out of your head if you saw 50% of the press releases I get in a day. Fear-based marketing with no scientific evidence really has saturated products marketed to women. It’s just one after another of “toxins” and “detoxifying”. They think I’m some dumb women sitting behind a screen? Idk. I had one where the only scientific research they referenced was bogus and from a predatory scientific journal. Anyway, I hate it so much and it gives me those angry/sad feelings. Anyway, OML doesn’t market that way. I feel like Sarah liked the challenge of having a botanical palette and it is what the customer wanted. She has made it clear that if someone is going to have a reaction to perfume, most of the time it’s going to be something natural. I’m like you. I’d rather reapply throughout the day than having the synthetic “base”. The tradeoff with naturals is that they don’t last long on the skin but that’s actually why I like them too. There are times when I only want a few hours of wear (certain work environments, my frivolous mood, etc.). Anyway, I felt like a few of these were really creative and not like other naturals I’ve tried. I’m not a chemist. This is my hobby. I’ve had the chance to smell a lot of raw materials and aromachemicals because of this blog. But, I’m not an expert. I was actually surprised to see that the hypo-allergenic fragrances were the sort of sharp woods/musk that I personally do not like. Those feel like ice picks in my sinuses. I wish someone could explain to me that phenomena. It’s more than “I don’t like it”, it makes me feel uncomfortable (not sick or “allergic”, but like really uncomfortable). Yes to having a thoughtful approach to a new line rather than rehashing the same. And double yes to fickle moods. We only have a limited number of arms, rooms and days on/in which to spray the plethora of beautiful scents!! Yes, I actually love the separate line. It’s very smart. I was out sniffing yesterday and now I can’t remember what I sniffed, but I thought, geez, they should just do another line. It was one of those niche brands with like 18 fragrances and none of them really seem “related”. Now I can’t remember but I remember thinking they should have just had like 6 different trios because it was confusing.